Why do kids put undies on their head? It’s something I’ve asked myself on more than one occasion and I have more than one photo of my kids wearing undies as a hat to prove it! Meet Sally Snickers – she’s the star of Lynn Ward’s new book, Sally Snickers’ Knickers. Sally doesn’t wear a hat because she’d rather wear her knickers on her head. 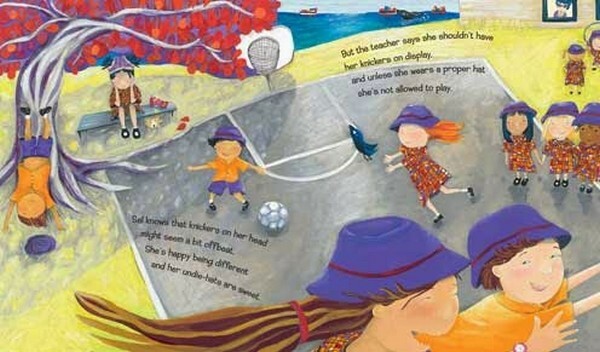 With her pigtails poking through the leg-holes and a wardrobe of undies to suit every occasion, Ward’s fun rhyming text reveals what happens when Sally is told that she must wear a hat if she wants to play in the schoolyard. Ward plays on the wide variety of underwear available to add to the humour and coupled with illustrations by Anthea Stead, it’s a winning combination. and lycra when she’s biking. Stead uses mixed media to create striking and richly coloured pictures. She has a particular flat style, allowing Sally and the other characters to loom large on the page and to stand out against the softer backgrounds – water composed of dreamy blues, the asphalt playground in muted grey oils and grass, a textured citrus-green. 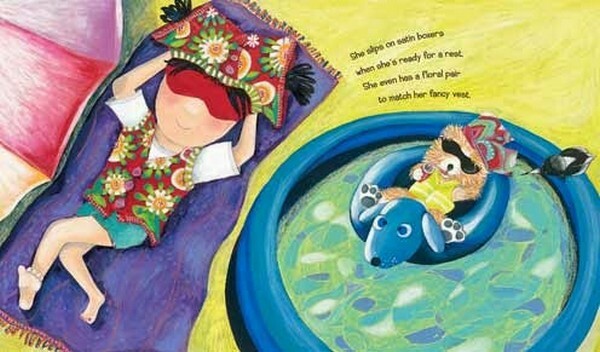 The highlight is Sally’s little dog, who also wears undies on his head – he can be found on almost every page getting up to all manner of tricks. Sally Snickers’ Knickers is suitable for children aged three-years and over. It will appeal to kids who have recently toilet-trained and are discovering a ‘wardrobe of undies’ however it’s a particularly good choice for school-aged children to demonstrate that being different from the group is okay. Obviously Sally’s point-of-difference is delightfully silly but the message is clear enough to be applied to any number of differences that children may have. 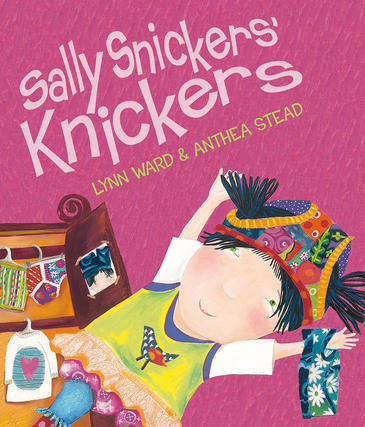 Find Sally Snickers’ Knickers in all good book stores or online at Fishpond.